Please refer to our stock # 1914 when inquiring. Colima Pottery Tlaloc Incensario in Janus form looking into the future while looking into the past, Mexico, ca. 100 BCE - 250 CE. The Aztec god of rain, agriculture, fire, and the south. The obverse deity surmounted by two intertwined snakes. Strong facial features with large protruding eyes, hands on his knees. Reverse side without hands and smaller head. One of four legs professionally reattached from original piece. One leg professionally reattached and in excellent condition. 14 3/4" high. Ex: B. Rhodes collection, FL. Tlaloc (Tlá-loch) was the Aztec rain god and one of the most ancient and widespread deities of all Mesoamerica. Tlaloc was thought to live on the top of the mountains, especially the ones always covered by clouds; and from there he sent the vivifying rains. The rain god was a pan-Mesoamerican god, whose origins can be traced back to Teotihuacan and the Olmec. The rain god was called Chaac by the ancient Maya and Cocijo by the Zapotec of Oaxaca. 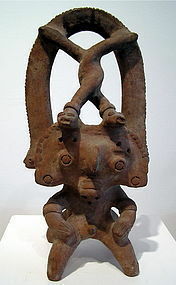 The rain god was the most important among the Aztec deities, governing the spheres of water, fertility and agriculture. Tlaloc oversaw the crop growth, especially maize, and the regular cycle of the seasons. Archaeologists and historians suggest that the emphasis on this well-known god was a way for the Aztec to legitimize their rule over the region. For this reason they built one of the two most important shrines within their capital, on the top of the Great Temple of Tenochtitlan, just next to the one dedicated to Huitzilopochtli, the Aztec patron deity. The image of Tlaloc is one of the most represented and easily recognizable in Aztec mythology and is similar in other Mesoamerican cultures. He has large goggled eyes whose contours are two serpents which meet at the centre of his face to form his nose. He also has large fangs hanging from his mouth and a protuberant upper lip. He is often surrounded by rain drops and by his assistants, the Tlaloques.